Custom kids blankets are a gift that can last a lifetime. 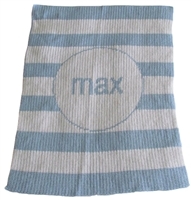 Little kids love the comfort and warmth that the soft blankets provide and will remember them fondly as they grow up. Our custom baby blankets make it possible to create a one of a kind blanket that reflects original character and personality of you and your family. You can choose from two sizes to make it the perfect personalized baby blanket, a good sized children’s blanket or even a comfortable throw for any bed or couch. By having personalized baby blankets with names on them, you're making something special for you and your child to cherish. Tiny Keepsakes aims at making the process of ordering kid's personalized blankets as easy as possible. Just like our customized step stools or our birth announcement plaques, you can order one of our baby blankets with name for your special little one in a few short steps. As always, we value quality when carefully hand selecting our entire inventory. In addition to this quality commitment, we highly value our customers. We want your customized baby blankets with names to last a lifetime and not cost you a fortune in the meantime. In case you have any further questions, don’t hesitate go call us at 888.320.3080 or email us at customerservice@tinykeepsakes.com. That’s why we offer a 5% discount to all new customers and a customer loyalty program with even bigger discounts with every repeat purchase. Just use the promo code STEP when you check out and get ready to save money on many future keepsakes to come!